Join in on a journey through time on Lake Michigan. On this 75-minute sailing journey, you will hear stories of piracy and much more. 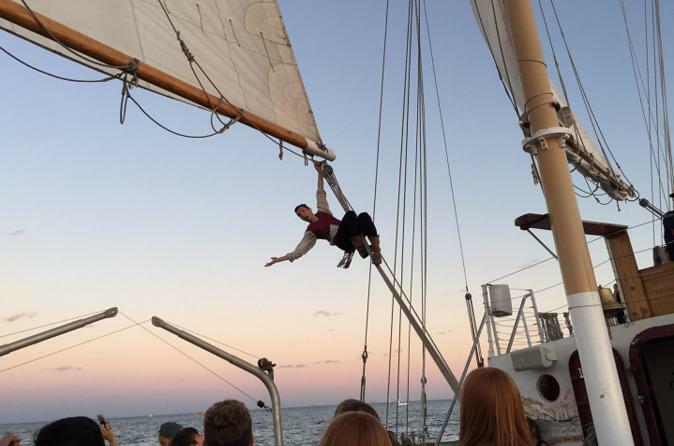 Come join this 75-minute sail on Lake Michigan. On this journey, you will hear true piracy stories from epic battles to trickery and treasure. Get a hands-on experience while listening to the incredible ales of real pirate adventures that happened right here on these magnificent inland seas, many years ago. The tall ship crew consists of multi-talented individuals, many of whom have experience in the study of history, maritime lore, arts, music, and theater. Each are ready to bring their experience to enhance your enjoyment aboard Windy! You can simply relax on deck in quiet or gather around for storytelling and hands-on fun.